These Winter Safety Tips for Dog Owners Are Simply Awesome! Winter is approaching and that means colder temperatures are on the way, snow will soon start falling in many parts of the country, ice will be forming on well, everything and people will hustling to keep warm. This is also the time we should begin thinking of the many hazards winter brings to our dogs and what we can do to protect them from these hazards. From regulating body temperature to frostbit paws to poisonous chemicals, here are 10 winter safety tips that will help keep your four legged friend warmer, safer and more secure throughout the harsh winter months. Too often we hear stories of dogs that had to be rescued from icy waters (and those are the lucky ones). It might look like fun to slide across that frozen pond, but ice can easily crack and your dog, and you, could fall in. Slipping on ice can also lead to muscle strains and other injuries. Look at the Iditarod sled-dog teams and you’ll notice that their paws are covered by booties. Mushers know that the race may be lost because of injuries and abrasions from running on ice. 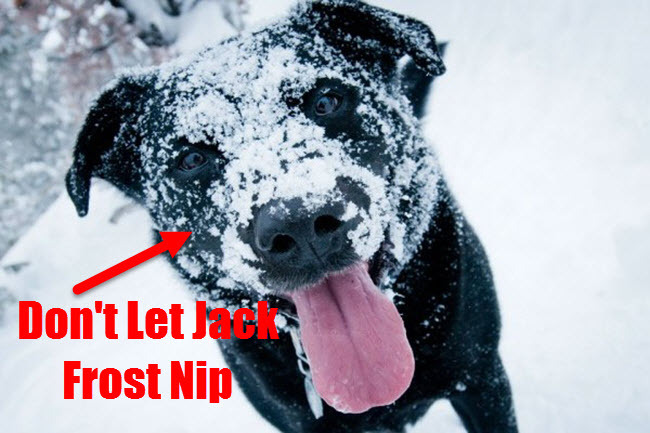 Even if your dog isn’t dashing through 1,000 miles of frozen Alaskan wilderness, winter conditions can still do damage. Pet stores offer dog boots or paw protectors that work well to keep your pup’s feet safe. Hair on the feet of long-haired dogs can form ice balls between pads and toes. Keep them well-trimmed, cutting the hair so that it is even with the surface of the foot. City streets are coated with such de-icing substances as sodium chloride (rock salt) and calcium chloride, which make sidewalks safe for pedestrians, but can damage paw pads. Make sure you wash them off. Some people keep a bucket next to the door to rinse their dog’s feet as soon as they come in from the cold. Use warm water and make sure to reach spots between the toes and pads. Some dogs will also need a moisturizer for dry skin. For dogs who will wear them, booties may be the best solution for winter foot protection. For dogs who won’t wear shoes, some people use paw wax, such as Musher’s Secret. Even a big fuzzy dog who lives indoors will need some time to acclimate to freezing temperatures. Short romps outside will help your dog’s body get used to the change in the weather. As little as a teaspoon of antifreeze can cause kidney failure. Be alert to the signs that your dog has swallowed some of it, which include drooling, vomiting, seizures, excessive thirst, and a drunken appearance. If you think your dog has ingested antifreeze, it’s important to get to a vet as soon as possible. Even if you keep your antifreeze safely tucked away, there is still a danger from residue in the streets. Most antifreeze is green ethylene glycol, but it comes in several different colors. So watch where your dog is sniffing.